If you've watched shows like "True Blood" and "American Horror Story," you've seen Janeshia Adams-Ginyard in action and maybe didn’t even know it. If you’re watching Fox’s “9-1-1,” planning to see the “Avengers: Infinity War,” or loved “The Mindy Project,” “American Horror Story,” or a host of other shows and commercials, you’ve seen Janeshia Adams-Ginyard in action and maybe didn’t even know it. As an African-American stuntwoman, she’s an uncommon figure on Hollywood sets, but she’s making her biggest step into the spotlight on Feb. 16 when “Black Panther” hits theaters - in what is being anticipated to be the biggest February opening in history, already breaking box office pre-sale records. “Black Panther” was her longest time on a single project, having shot for 18 weeks, from 2016 through 2017. Her story, her popularity and her passion for what she does and wants is an inspiration, especially to people that are looking at how they can make their way into the business. In only seven years in the business, she’s performed in 25 movies and TV shows, and says she’s done even more work in commercials. Adams-Ginyard talked with NBCBLK about the simple moment that she knew she was destined to perform stunts on film, challenges she’s faced in the industry and what has always driven her to take on the most daring on-screen stunts. NBCBLK: This dress that you had on at the Los Angeles premiere made quite a moment on the carpet. Before we get into your career and background and everything, I think people want to know about that dress! Janeshia Adams-Ginyard: Shout out to my team, we knew I was good when I walked out but the reception that the public has had has been truly humbling and a little overwhelming. This was a year ago, I’d already had a vision of what I wanted to wear, so I found some pictures of things that kind of reflected that, and I sent it to Tamara. She said, ‘I can do that, no problem.’ I was very determined to have someone that actually worked on the film do my dress for the red carpet - or I should say “purple carpet” - because there was so much talent involved with our costume and the stuff you see on screen, that it just made sense. You are a bit rare in Hollywood, tell people about what you do, and how uncommon you are in the industry. 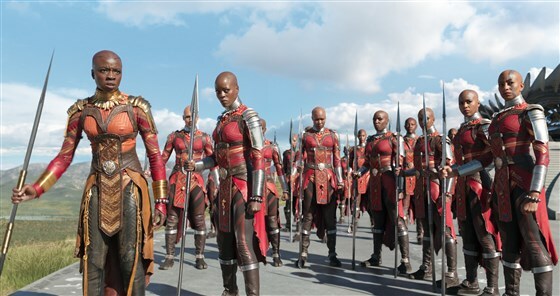 I am a stuntwoman and actress, and I have a background in wrestling and Taekwondo, and I was very blessed to be a part of this project, as one of the Dora Milaje, which is the all-female bodyguard/special forces to the Black Panther, and that was very cool. There still isn’t a wide range of [black stuntwomen], but thank God there are some. I’ve had some veterans that paved the way for me back when there were just a handful of black females doing stunts, so I’m not as rare as maybe back in the day. Do you feel like you face different challenges than your non-black counterparts? Absolutely. I know I’ve experienced different challenges. Just in the matters of how you interact with the different people on a set. I can speak from personal experience. When you look like me on the set, and you are telling someone, ‘No, you’re wrong,’ or ‘No, that’s incorrect,’ they take it as we came off as angry, we were rude. I had two witnesses right there, but ever since that experience, I don’t talk to anyone on set without there being a witness. Where did your desire to become a stuntwoman come from? How did you figure out this was a lane for you? I’ve always been an athlete, my entire life. I started in track from ages 8-12. I was already a national champion at that age in the relay. I did track and I did volleyball in high school, and I continued to do track in college. After track I was on the U.S. national bobsled team for a short period. [But I wasn’t] trying to get any bigger - bobsled athletes pick up muscle and [I wasn’t] trying to look like an Amazon. So I wanted to move back to SoCal and start doing athletic print, catalogs, sports commercials, stuff like that and I did it! Whatever I put out into the universe it comes back to me. I did that for a while and I was sitting at home and watching a movie. I remember watching this guy run - horribly though! He ran horribly! And I thought I’d done track, I could be doing this. I saw all the credits, it had all the stunt people in it, and from that day I thought ‘I need to be doing stunts, I’m going to be a stunt woman! I’m an athlete, I’ve been athletic my whole entire life, I just competed for my country, why not?’” That’s when I first made that transition, and that was in 2010. Finally what was your favorite memory from the filming of “Black Panther”? My favorite day would be my birthday, I actually had to work on my birthday, - which is Valentine’s Day - and it is also Danai Gurira’s birthday, she plays Okoye. The reason that day was so awesome was I’d got to do a stunt, I did the stunt really well, I was really consistent and Ryan Coogler, the director, was saying I was just so good, ‘Good job, Janeshia, so consistent, every time!’ Then he found out it was my birthday and Danai’s birthday and he had the whole cast and crew sing Happy Birthday to us. That was my favorite day of shooting the whole entire movie.